Chinatown has the city’s lowest car ownership rate, and yet its residents — mostly low-income, elderly and monolingual immigrants who primarily walk and take Muni — have to deal with some of city’s worst automobile traffic. Broadway between Columbus Avenue and the Broadway Tunnel is lined with bustling grocery stores and restaurants, including some that have been fixtures in the neighborhood for decades, along with community-based organizations and Jean Parker School. 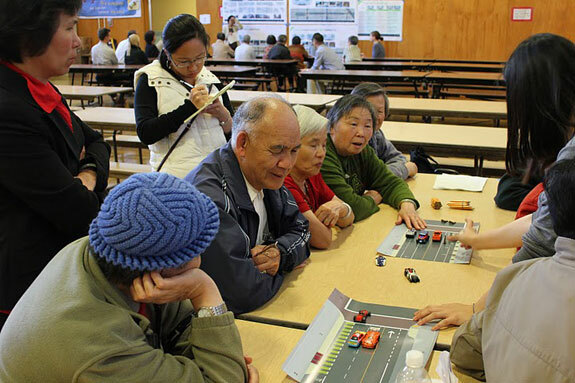 CCDC, the Planning Department’s outreach partner on the Chinatown Broadway Street Design project, stressed that Chinatown’s 15,000 residents have been historically underrepresented in transportation planning. As an environmental and social justice issue, CCDC has undertaken a collaborative process with the city to bring about a street redesign with strong community input. The effort is part of a Caltrans environmental justice grant. “There’s some institutional biases going on in terms of planning processes in general, and that’s part of our goal, is to balance a little bit,” said Deland Chan, the senior planner at CCDC. Working with Planning, she said, another objective has been to make the process engaging for Chinatown’s residents, and the materials easy for the non-planner to understand. 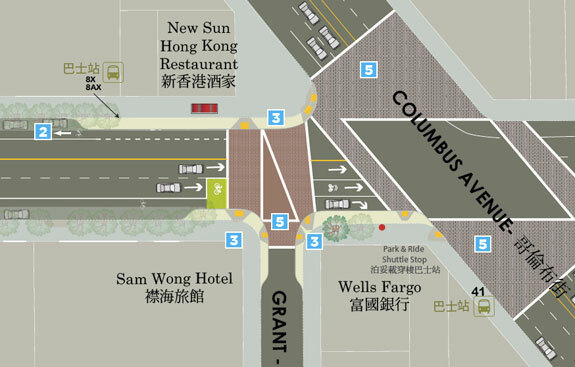 At a recent workshop, where plans were presented in Cantonese, participants got a chance to review the tentative design options, which were crafted based on feedback gathered at the initial workshop in May. Option A [pdf] would require the removal of the existing morning rush-hour lane in the eastbound direction, and focuses on bulb-outs for increasing pedestrian space and shorter crossings at the corners and mid-block. It would include only sharrows for bicycles. Lighting and street furnishings, such as benches, would be included. Option B [pdf], a road diet, would remove the eastbound rush hour lane as well as a westbound travel lane, which would allow bike lanes on both the north and south sides. It would include bulb-outs on both sides of the street, along with crosswalk improvements. Option C [pdf] would widen the sidewalks along the entire stretch, and change configurations depending on which direction rush-hour traffic is going. During morning rush hour there would be a rush hour lane of traffic, along with a curb-side bike lane on the south side of the street. On the north side, there would be curbside parking and loading and a floating bike lane. During evening rush hour, it would flip. “A lot of the participants indicated they wanted to see pedestrian safety improvements. Four out of six groups called for pedestrian scramble signals on Stockton and Broadway, and also wanted to see more sidewalk extension and width there,” Chan explained. In an interview, Lily Langlois, the city’s lead planner on the project, and Nick Perry, also a city planner, said their team is tabulating the survey results from the last workshop and is looking to revise the designs based on feedback. They said any new street redesign will have to complement efforts to improve Columbus and the Broadway Tunnel. The SFMTA has recently indicated it is exploring removing a travel lane to build a bike facility in the north bore of the tunnel. Earlier this year, it scrapped a plan to put sharrows in one of the lanes, after bicyclists complained that it would be dangerous to encourage people on bikes to take the lane. Perry said the drawings for the three options are focused primarily on basic roadway layout. A more in-depth discussion on streetscape elements such as trees, mid-block bulbs, lighting and seating will occur at a future workshop after a preferred option is selected, he said. The Planning Department’s Environmental Planning division is also working with the SFMTA on traffic modeling and an analysis for all three options as a part of the project. The Planning Department is encouraging the general public to review the designs and give feedback. You can fill out the survey here. 1) I’m glad they acknowledged something has to be done about speeding through the Broadway tunnel. While these ideas are nice, if cars are still coming out of that tunnel at 40-50+ mph, it isn’t going to do much. Also, can’t dump cyclists off at the mouth of that tunnel and expect them to survive a trip through there. 2) Can we please address Stockton St? Stockton is much more pedestrian intensive and improvements would directly impact the 30/45/8x lines. Also, we could show how useless the CS will be if street level changes are made and enforced. As long as we continue to prioritize tunnels (Broadway and Stockton) for private autos, the streets that feed into them will continue to be hazardous to those that live in Chinatown and North Beach. Excellent work. I prefer option 3 as it widens the sidewalks and still preserves acceptable bicycling conditions. the floating bike lanes do work in my opinion. Re: the Broadway Tunnel. One lane in each direction would make it safe for cycling and reduce speeds somewhat. A meager solution is an old one that we came up with a decade ago that ought to be reconsidered. It expects cyclists to use the sidewalk uphill and the roadway downhill. On the uphill sidewalk, build a small cantilevered platform to widen the sidewalk by about 6 inches. It’s still a little narrow, but it means pedestrians won’t have to stop when cyclists pass by. In the downhill direction, install more flashing lights and unambiguous signage to get motorists to respect cyclists taking the whole lane. On the Stockton note, I’d like to see no right turns from eastbound Broadway onto Stockton. Drivers are very aggressive towards the pedestrians and creep into the crosswalk. Plus, anything to keep private autos off of Stockton is a win for Muni. What about Stockton? Trying to walk down Stockton on a weekend is insane. Sometimes you move a foot every 10 seconds. I agree that option C looks like the best, but I like the bump-outs of option B. However, still seeing sharrows on all 3 plans to direct cyclists into the Broadway tunnel makes me pretty upset. Leave the sharrows off until they do something about the Tunnel, it is not OK as is. Can’t wait for the Central Subway. I walk in the street. Precisely. Widening Broadway sidewalk is nice. But it is Stockton sidewalk that’s really overflowing. Pedestrian scrambles, while not the best name offer the easiest and quickest short term solution for pedestrian safety. Simply having traffic stopped in all four directions for even just a precious 10 to 15 seconds between cycles does wonders for slowing down auto drivers who otherwise roll through to make a right on red turning green, or try to time a left turn at speed and jumping the light as it (or very commonly right before it) changes, and before stopped oncoming traffic gets moving. In general pedestrian countdown timers should not also signal the countdown for a light change. I have seen and heard too many drivers gun it through an intersection while turning into an active crosswalk just so they are in the intersection before the light cycle changes. More specifically with the above plans all are of a concern when they leave sharrows as a permanent bike solution for the tunnel. Any redesign of a two direction roadway that is to include bicycle safety improvement should include two full time designated lanes (a solid line) and physical separation where possible. The end goals have to be ped safety, bike safety, and no longer just just idiot auto driver proof, but aggressive driver proof. Can’t wait to hear about how you either don’t ride it or how it’s your own personal LRV since no one else is riding it. Is it time to be thinking of protected cycle tracks on streets like this? Regular bike lanes here might experience a lot of double parking/loading. Cycling around Helsinki right now and it’s so nice not to share your bike lane with a lot of trucks unloading. Hi Davidbakerfaia, I’m cycling around Helsinki right not too. Kind of a coincidence. And I agree that a slightly raised cycle track alongside at least one of the sidewalks would be best on Broadway. Otherwise, we might as well just route all bike traffic onto parallel and less rapid streets like Pacific. Cars are just going to double park in bike lanes on such a busy street as Broadway. Even if someone just pops into a a store for a minute or two, that’s a minute or two of danger for the cyclist forced out into the auto traffic lane. One other note: the population in Chinatown walks and takes the bus, but rarely bikes. So I think we should prioritize public transit and sidewalk widths throughout Chinatown. Cyclists, like car drivers, are for the most part just passing through. We probably shouldn’t make cycling paths an equal priority as the sidewalks in this part of town. And I say that as one of the few cyclists who is using Chinatown to shop for food. I live nearby. The more I think about Helsinki’s bike/ped solutions, the more I wonder if it might be best to change the Broadway tunnel in the following way: Widen the current raised sidewalk so that it has a cycle track in both directions and a pedestrian path alongside it and yet wide enough to accommodate about 5 persons across. The current sidewalk is too narrow for pedestrians walking in opposite directions. We cyclists don’t need to be riding super fast through that tunnel and can slow down a bit if a pedestrian steps into the bike lane. That’s what happens all the time in Helsinki. Bicyclists aren’t really vehicles here, except on streets without separated paths. Otherwise, most people pedal along pretty conservatively on separated ped/bike paths and share the space with pedestrians to some extent. It seems to work. There are few possible reasons why cycling isn’t popular and may not ever be popular in Chinatown. First a lot of people there are elderly and cycling on the street isn’t something they feel safe and physically capable of. Second Chinatown is a very hilly area. If you live live by Powell and work in Kearny, biking downhill may be easy but certainly not the other way around. We did senior housing in San Jose and were surprised by the number of older folks who had bikes, converted some car parking to bike parking for them. So I don’t think age is that total a negative indicator to cycling if you make it safe and attractive. Also note that I am an “elder” and ride! I agree with others that I’m disappointed in the lack of physically-separated bike lanes in this plan. I think we need to rename unprotected bikes lanes “Double-Park-In-Me” lanes to indicate how they will be used. I wonder about the logic claiming that the elderly (anyone over 50?) won’t ride bicycles in Chinatown because it isn’t safe, therefore, we shouldn’t do anything to make it safe. Look at this photo to get inspiration! Am also wondering why there is any car parking on Broadway at all? I would encourage planners to consider: widen the sidewalks in both directions, put in a protected bike lane that can’t be parked in in both directions, have no car parking, have a floating loading zone in the non-rush hour direction between the bike lane and the lane of car travel. If we put in double-park-in-me lanes (in the guise of bike lanes) we’ll be taking take them out and putting in physically-separated bike lanes in a few years anyway. Also, widen sidewalks on Stockton (or just reclaim street space for pedestrian use via some kind of barrier) and make the street transit, bike and ped only for five or six of the most congested blocks. And make Grant Street a pedestrian plaza already. This is a prime tourist spot, and what do we do with those tourists? Cram them onto crowded sidewalks where they can’t stroll comfortably or sit anywhere. We need to take a page from New York’s Times Square and envision how much more inviting and scenic this neighborhood could be without cars. The city would be better off building another parking garage close by than to waste valuable street space storing a few dozen cars. Why would we ever separate bicycle lanes? We would no longer be able to be the Great SFO Cell Phone Lot Extension that we are now? Where else can you make a cell phone call but in the bike lane? I mean, come on. It isn’t like open bicycle lanes can’t multitask as Taxi stands and tourist photography lanes. Why would any of us have a problem with that? These San Franciscan bike riders are just a bunch of whiners. They can go around the cars, it isn’t that big a deal. – this comment brought to you by those who can not see beyond their noses. Urbanic, If this is the case, then there are probably lingering ADA compliance issues with every physically-separated bicycle lane in the country. I would imagine the vast majority of unloading/loading would be by commercial vehicles. But if ADA compliance were truly an issue, then 1) there could be no loading zone at all at any time in either direction, or 2) there could be special disabled loading/unloading areas just off Broadway on Powell, Stockton and Grant, and even on the little side street of Cordelia next to Bayside Eldery Housing. Separated bike lanes were installed on key streets in Vancouver recently. Not only do the seem to function well for cyclists on busy streets, the landscaped barriers have improved the the overall esthetics of the streets. Copenhagen uses a subtle grade change for bike lanes. That too seems to work well.